Motorola had made the smartphone market active with the release of Moto G which was change for people who could not afford the flagship devices on which all the companies were concentrating on. The release of Moto G and then Moto E had again brought back the attention on budget smartphones in the market. There are rumours of Motorola working on Moto X+1 which were leaked recently and also the recent slash of prices on the Moto G in Flipkart which we can say might be due to the release of a new Moto G model or that it has got a lot of competition from the recently released Xiaomi Mi 3 which is priced similarly but with much higher specifications. 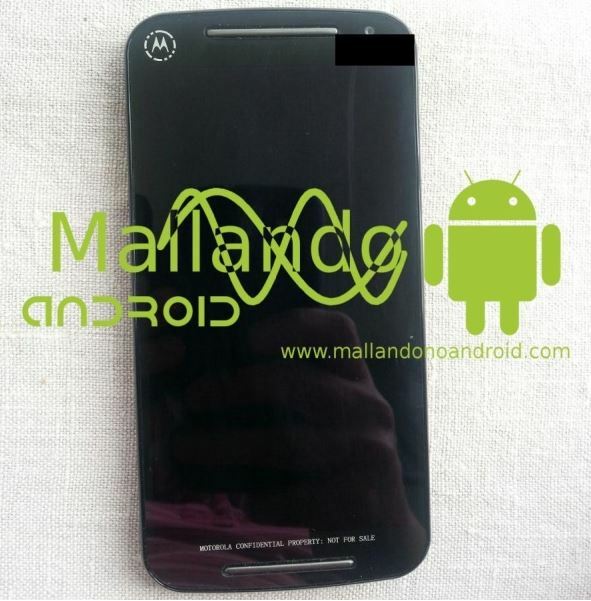 There are leaked photos of the Motorola Moto G2 with model name Moto G2 XT1063 which it might be called by mallandonoandroid.com. The images show that the design is slightly modified and it has a long horizontal button at the bottom of the device display. 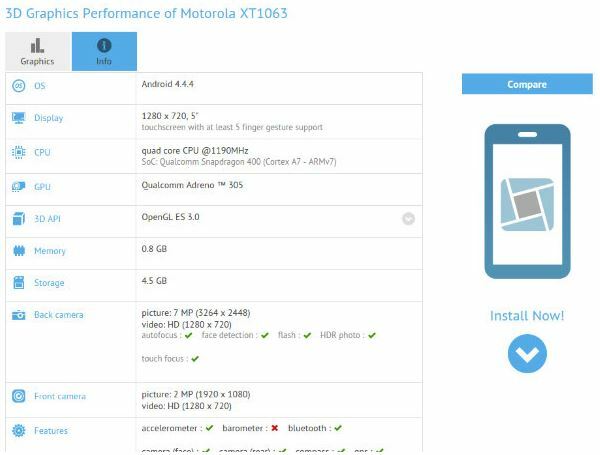 Along with the device photos there are leaked benchmark and specifications too which can be seen in the below images. The specifications which were revealed are as mentioned below with the device running on Android 4.4.4 KitKat which is supported by Quad-core, Snapdragon 400 processor having 1.2 GHz with Cortex A7 – ARM v7, the GPU is Qualcomm Adreno 305 and has a RAM of 1GB (0.8 GB to be precise) with 8GB internal storage. The Display size might be increased to 5 inches will be having a resolution of 1280 x 720 pixels and 320 ppi. The camera is a 8MP rear camera and the front is a 2MP camera, the resolution of images captured by the 8MP rear camera is 3264 x 2448 pixels and HD video recording at 1280 x 720 resolution having Auto focus, face detection and LED Flash and the front 2MP camera is 1920 x 1080 pixels. The device model name is XT1063 and this is a image of the 3D graphics performance of the device released by @Webtrek. The Moto G2 will be priced at par with its predecessor having one moto in mind to give superior performance at affordable prices. The expected pricing looking at the specifications will be anywhere around $150 – $200. The Moto G was released in November last year so we can expect that the Moto G2 will also be release around the same time period to be available for Christmas and cash in on the Christmas shopping craze. We will be updating the details and specifications as we know more about the device, keep in touch to know more about the Moto G2 device releasing this year end.